On Wednesday, February 1, police moved in and raided the Last Child camp, the remnants of the Standing Rock camp. 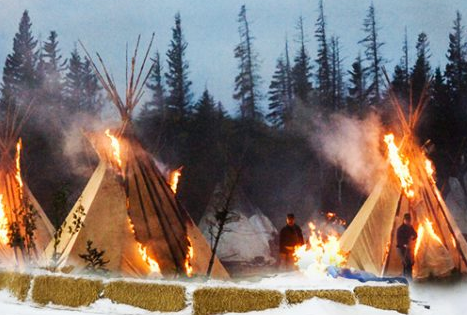 In a scene reminiscent of the American Indian Wars, they destroyed the camp and burned tipis. This move comes on the heels of Trump's Executive Order (EO) in support of the Dakota Access pipeline and the Keystone XL. The hypocrisy of Trump's EOs is dumbfounding. Apparently, the same people who lambasted Obama's EOs now laud Trump for doing the same. However, there is a salient difference, when Obama began using Executive Orders it was because he was facing an obstructionist Republican congress. The GOP now have control over both the House and the Senate. This raid comes after protracted protests from 200 Native American tribes and others that ultimately helped to halt DAPL under the Obama administration. During these protests, local authorities unsuccessfully tried to goad peaceful protestors into a conflict with dogs, pepper spray, water guns, sonic cannons, and rubber bullets. If built, the DAPL pipeline would transport 7.4 billion barrels of oil from North Dakota's Bakken formation. If it is built the 1,172-mile long pipeline would carry a half a million barrels of oil to market each and every day. This represents a carbon bomb of epic proportions. A pipeline is cheaper than trucks and trains and therefore reduces the cost of bringing such oil to market. However, there are very serious concerns about the propensity of such oil to spill and contaminate the drinking water of millions of people. Pipelines spill more often and are difficult to cleanup. As referenced by the Brookings Institute, A study by the International Energy Agency (IEA) found that US pipelines spilled three times as much crude oil compared to trains from 2004 to 2012. Simply put there is no safe way to transport oil. Some claim to support DAPL because of its economic value and because it creates jobs. The Dakota Access LLC, the company behind the pipeline, claims that the project will create 8,000 to 12,000 construction jobs and up to 40 permanent operating jobs. Brookings quotes Dave Swenson at Iowa State University who says that his research reveals that the economic benefits have been greatly exaggerated. He claims that the project will create only about 2 thousand construction jobs in Iowa for a single year. While jobs may be how some try to sell the pipeline, the tax windfall may be the real reason that some politicians are supporting the projects. The project will generate $156 million in sales and income taxes and $55 million in property taxes annually to the states of North Dakota, South Dakota, Iowa, and Illinois. Regardless of the financial gains, this is an environmental catastrophe and a pressing human rights issue. As 350.org founder Bill McKibben described it last November, "Standing Rock is the civil rights issue of our time – let's act accordingly"
Trump's callous disregard for Native people fit into the context of the dystopia augured by his coalescing administration. Trump has nominated former Exxon CEO Rex Tillerson as the Secretary of State. Tillerson has equivocated on climate change at the Senate hearings and it is expected that he will lift sanctions against Russia so that Exxon will once again be able to move forward with oil extraction in the Russian Arctic. Domestically, Trump is making good on his promise to kill environmental regulations. In fact, Trump's war against the EPA has already begun. He has put the fox in the henhouse by nominating Scott Pruitt, climate denier and friend to the fossil fuel industry as head the EPA.